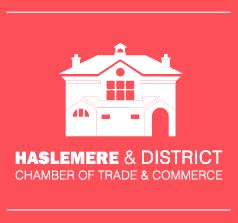 The association shall be called “Haslemere & District Chamber of Trade & Commerce” (hereinafter called “The Chamber”). To promote and protect the commercial, professional and general interests of the Chamber and its members. To improve members’ business knowledge and understanding. To provide support functions for members’ businesses and organisations, such as the provision of training and business advice. To act as an information point for businesses operating or based in the Chamber’s area. To provide useful information and contacts via the Chamber website. To discuss and promote measures intended to benefit the business interests of the Chamber. To promote friendly relations amongst persons interested in the commercial welfare of the district. To make known the advantages of Haslemere and district as a commercial, residential and tourist area. To support charitable fundraising activities where considered appropriate to the interests of the Chamber and the well-being of Haslemere and district, and its inhabitants. To discuss and deal with all matters (non-political and non-sectarian) arising relative to local affairs. Membership is open to trading entities and others having genuine business or commercial interests, within the defined area covered by the Chamber, who are properly registered to be in business on their own account. Members can be companies, partnerships, sole traders, registered charities, not-for-profit organisations, and national, regional, district or county authorities who operate from premises within a five mile radius of Haslemere Town Hall, subject to the discretion of the Executive Committee to vary this distance. Individual members may also be appointed as described below. There will be three categories of membership. Full membership: Properly constituted and registered businesses operating within the defined area of Haslemere and district. Full membership will allow benefits as defined by the Executive Committee and full voting rights. A representative of the member organisation may stand for election to the Executive Committee. Individual membership: Individuals who have or will provide services to the benefit of Haslemere may be invited to become individual members on an annual basis. Any such individual with business interests during the period of membership outside the defined area will be unable to register or promote such business as a Chamber member. The Individual annual subscription will be by voluntary donation set by the general meeting. Life membership: Individuals whose nomination by the Executive Committee is approved at an Annual General Meeting will be invited to be a life member. Past Chamber Presidents will automatically become life members. Retiring presidents on completion of their terms of office will be invited to become life members at the Annual General Meetings at which they retire. No annual subscription will be payable by life members. Any life member with business interests outside the defined area will be unable to register or promote such business as a Chamber member. Application for full membership will require completion and submission of an application form including confirmation that prospective members meet the criteria of membership. Prospective members may be asked to attend a meeting convened for the purposes of considering membership applications before acceptance. The Executive Committee has the right to reject applications for membership and is not required to give reasons for its decision. If accepted, and on payment of the required subscription for the remainder of the calendar year, the member will receive a membership pack. Once a member’s application has been accepted, the member shall nominate in writing or by email a representative, whose name shall be entered in the register of the Chamber as representing the organisation and who shall have full authority to exercise all rights of membership on behalf of the member and shall have the right to appoint a deputy. Only one person from a member may attend and vote at general meetings or at other times when a ballot is held. Subject to the Executive Committee’s discretion, a member ceasing to trade or no longer operating within the defined five mile radius of Haslemere Town Hall will no longer be entitled to be a member and will be required to resign. No refund of subscriptions will be made. The Chamber may from time to time organise meetings, seminars and talks designed to bring benefits to the Chamber and its members. Charges may be made for attending these events. Annual subscriptions and any joining fee will be proposed by the Executive Committee for approval at the Annual General Meeting, to take effect from the following 1 January. Membership renewal will be on a calendar year basis and 28 days before annual renewal an invoice will be sent to each member, confirming the required fee for the forthcoming year. Failure to pay the required membership fee within 21 days of the renewal date will result in cancellation of the membership. New members joining part way through the calendar year will pay a pro rata subscription calculated from the start of the month in which they become members. If a member resigns for any reason or is expelled he/she will not receive a refund of subscriptions for the unexpired period of the year. The day to day running and management of the Chamber shall be the vested in an Executive Committee consisting of a President, Vice President, Treasurer, Secretary plus four elected members. With the exception of the President who will serve for two consecutive years all other Officers and Committee Members will be elected annually at the Annual General meeting. The four elected Committee Members are expected to take responsibility for public relations, communications, events and fund raising and other relevant activities to the Chamber. The Executive Committee may co-opt up to two additional full members in any year but they will not be eligible to vote at Executive Committee meetings. If any member of the Executive Committee shall, in the opinion of the majority of the Executive Committee when a quorum is present, be unreasonably absent for more than THREE successive meetings expressly convened for executive matters, he/she shall be considered as having resigned from the Executive Committee. The Executive Committee shall have the power to purchase, take on lease, employ, hire services or otherwise acquire any real or personal property, and any rights or privileges which the Executive Committee may think necessary or convenient to meet the aims and objectives of the Chamber. The Executive Committee shall have the power to borrow money or raise loans as required. However, any borrowing and the amount has first to be approved, by two thirds of those present and eligible to vote, at a General Meeting of the Chamber. The Executive Committee shall have the power to appoint sub-committees and these shall have the power to co-opt Chamber members to serve on them. Such co-opted members shall have no voting rights when attending meetings of the Executive Committee. The Executive Committee shall be the sole interpreter of, and decide on any question of, the Constitution. The Executive Committee members shall be indemnified out of the assets of the Chamber in performance of their elected duties. The Executive Committee will set the agenda for all Chamber meetings, and for dealing with special or urgent matters which may arise, with power to act as the Chamber. The Executive Committee shall also consider all matters to be discussed by the Chamber at any General Meetings and shall make recommendations to such meetings. The President shall take the chair at all meetings of the Executive Committee and other Chamber meetings at which he/she is present and in his/her absence the Vice President shall preside, and in the absence of both the meeting shall elect a Chairman from the members present. All members of the Executive Committee must be the appointed representatives of fully paid up Chamber members as defined. The Executive Committee shall meet regularly throughout the year, five members to form a quorum. There shall be at least ten meetings in a calendar year. The annual diary of dates of meetings and other known events shall be sent to all paid up members at the time of their renewal or first joining. Should any full member require a motion or topic to be discussed by the Executive Committee then he/she should submit this in writing to the Secretary. The motion or topic will be included on the agenda at the next scheduled Executive Committee meeting. Should the motion or topic be of a more important nature then an Executive Committee meeting may be called by the President specifically to discuss this. The member who has submitted the motion or topic can send its nominated representative to the Executive Committee meeting(s) when the matter is being discussed. Should the Executive Committee discuss any motion or topic in which a member of the Executive Committee has an interest or a conflict of interest then that person must declare this at the start of any discussion and leave the meeting until all discussion and, if required, voting has taken place. The minutes of the meeting will record the declared interest and that the individual left the meeting. The Executive Committee may publish extracts or full minutes of meetings if it considers this to be in the interests of the Chamber. Annual and other General Meetings. The Annual General Meeting shall be held no later than the end of April each year. The date and venue to be notified to all members at least TWENTY ONE days in advance by the Secretary or Chamber Administrator. (a) To receive the Annual Report from the President. (b) Presentation and approval of the annual accounts of the Chamber. Four members of the Executive Committee. Any person being a representative of a full member wishing to be nominated for election to the Executive Committee as an Officer or Committee Member and not being in office at the time of the Annual General Meeting will be required to give written notice to the Secretary at least THIRTY ONE days before the general meeting so the nomination can be circulated as part of the notice of the meeting, along with those existing Officers and Executive Committee members who wish to be considered for re-election. Voting in elections of candidates to any vacancy will be by a show of hands unless a ballot is called for and agreed. One vote per full Chamber member only and only one individual per full membership can be elected. (d) To appoint an independent examiner. (e) To approve the annual subscriptions and joining fee for the start of the forthcoming year, as recommended by the Executive Committee. (f) Such other business as shall have been communicated to the Secretary and included in the notice of the meeting sent to members. The President, Vice President, Treasurer and Secretary shall be ex-officio members of all committees including the Executive Committee. The Secretary, on requisition of the President or five members of the Chamber may convene a Special General Meeting. The object of such meeting shall be stated on the requisition and not less than TEN DAYS’ notice of the meeting and the subject to be brought forward there shall be given by circular to all members. The Secretary shall call the meeting within ten days of receiving the requisition. The Chamber and the Executive Committee will use emails whenever possible to communicate with members on regular aspects of Chamber business such as newsletter, forthcoming events, general communications and notice of General Meetings. It is the responsibility of the member to advise the Secretary or the appointed Administrator of changes in the nominated person’s email contact or other relevant changes by email or in writing. The correspondence address of the Chamber is published on the Chamber website. Voting at Chamber General Meetings shall be by show of hands with one vote per full member. A secret ballot may be held if agreed to by one third of these present by a show of hands. In the case of a tie on any voting, the President shall have a second or casting vote. . The Honorary Secretary shall be elected by the Chamber in general meeting. The Secretary shall conduct correspondence of the Chamber in conjunction with the President and shall have custody of all documents belonging to the Chamber. The Secretary shall keep full and correct minutes of all proceedings at all meetings both of the Chamber and of the Executive and of other committees of the Chamber. The Executive Committee shall have the power to appoint a temporary Honorary Secretary in the event of death, resignation, dismissal or inability to act of the person for the time being holding the office of Secretary respectively and such temporary Officer shall have the power and continue to act until a new Secretary shall be appointed by the Chamber in a general meeting. The Executive Committee shall be empowered to appoint a paid Administrator to assist with the workings of the Chamber. The Administrator is directed by and reports to the President. The Administrator may be required to attend meetings of the Executive Committee, but shall not have voting rights. Independent examiners will be appointed at the Annual General Meeting to examine and report on the Chamber’s annual statements of account and balance sheet. The examiners shall certify the same before they are made available for presentation and approval at the next Annual General Meeting. The Treasurer shall keep an accurate and up to date record of all receipts and payments. Cheques and cash shall be passed to the Treasurer to be paid into the bank for credit of the Chamber. Cheque payments shall be made by the Treasurer, and shall have two signatures of elected Officers. Online payments may be made by the Treasurer once prior approval has been obtained from one other Officer on presentation of an invoice or other supporting paperwork. A member of any category may at any time by giving notice in writing to the Secretary resign his/her membership of the Chamber but shall continue to be liable for an annual subscription due and unpaid at the date of his/ her resignation. The entry of the member on the Chamber website will be removed. Any member who, in the opinion of the Executive Committee after due consideration, is considered for any reason unsuitable or ineligible to continue as a member of the Chamber, shall be called upon to withdraw or resign his/her membership, or be in default at the expiration of FOURTEEN days from the date of the notice. The person or organisation to whom such notice shall be given will immediately cease to be a member and forfeit all rights of membership and will have their entry and any information removed from the Chamber website. The member in question shall have the right of appeal to the Executive Committee. A specially formed sub-committee of three members including at least one Officer will meet to consider the appeal. The member may attend the meeting, send a nominated representative or submit a written argument for having the decision reconsidered. The decision of the sub-committee will be final and communicated to the Executive Committee and the member in question. No alteration of or addition to the Constitution of the Chamber shall be made except at an Annual or Special General Meeting of the Chamber. TWENTY ONE days’ notice must be given to Chamber members of changes or alterations proposed by the Executive Committee. Any motions for alteration from members shall be proposed and seconded in writing by fully paid up Chamber members with at least two years’ continuous membership. Such motions must be submitted by 28 February before the next Annual General Meeting. Subject to the provisions of Section 8 (above), a Special General Meeting may be called to consider changes to the Constitution. The Chamber may be dissolved with the consent of at least two thirds of the members present at a Special General Meeting duly summoned for that purpose. The assets of the Chamber shall be given to a local charity and not distributed to members.